Why am I becoming better everyday? As you listen to this song, can you sense the magic, the dancing along the journey called life looking for opportunity to come into form, manifest and bless? This song is called “Autumn” yet to me it feels more like “Journey”. For my life experience Giving has played a part since early on. Giving of myself as I knock on a new neighbors door offering my friendship; to sharing gifts spontaneously without thought; to give of my time may that be offering a ride to a older woman walking home with many groceries to her home. When I was sixteen, I travel to Japan for a Buddhist convention and gifted Sensei a sacred scroll given to me called the Desiderata. There inhttps://youtu.be/ZiC_9RHTvsA Japan at an orphanage, the watch my mother had just given to me before my journey, I gave to a little girl who had become attached to me. As a young person I didn’t have many items so to speak of. But these were my present treasures to share with along with my heart. Since then giving to my children, family and strangers have continued to be part of my life. Even turning on twinkle lights in my home is a gift I give to myself, a gift of delight and magic to watch my home light up with enchantment. That is my gift to my soul. 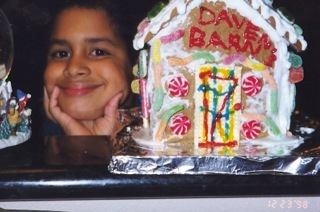 Years ago when my son was younger, we had a ginger bread house decorating party where I made 10 ginger bread houses from scratch for each person to decorate! Wow… what a feat that was making all of them, seems so long ago. Down the center of my beautiful cherry table was all the fixings to decorate the houses with. What a wonderful event that was. After I decorated my house I decided to gift it to a child in my son’s class who was dying of leukemia. Christmas eve night came and I traveled after mid-night and drove across town to his house, place it on the door step with a letter from Santa sending him blessings. When school was back in session in January I was helping out in my son’s class room and listen to the children share what they got for christmas. I heard this little boy share about the ginger bread house found on his door step. The bitter sweet of hearing it was the lack of enthusiasm/energy/excitement in his voice compared to the other children of all their sharing. I thought to myself how silly of me to think he would be more enthuse when he was dying…the life force was draining out of him. Not long, maybe a year later he graduated from this life as a little boy back into the powerful soul he truly is. By spring it came into fruition along with his first horse Beau! 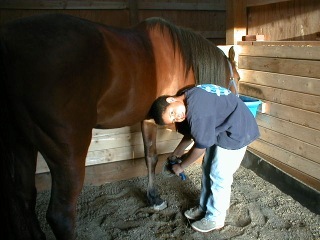 Here he is in the barn and horse I gave him. My son’s life has been an amazing journey watching him manifest his life from his desires. My son Daven, fathered a son Dieszel, who loves my dogs. 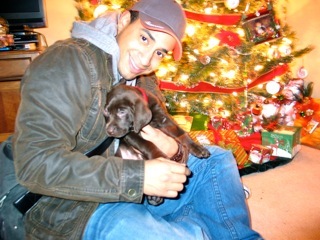 So my son and my grandson’s mother Gela gave their son the ultimate christmas gift a puppy last year! The art of giving comes in small acts of kindness and to great sacrifices at times. Who will you bless today or this season, with an act of giving?